When I was a kid, I accepted that this was “how choose your own adventure stories work.” As far as I knew, separating choice text from story action was the only way to handle choice at all. It made these books easy to read. It standardized them. This uniform look was part of “the brand.” It was also similar to the way that all of my favorite narrative videogames presented choice. I pretty much continued to believe this all the way until I started writing my own stories with Twine. Over the past four years I’ve come to realize that the way you present choice to the player has a huge effect on the overall mood and internal logic of a CYOA story. Changes to the way choices appear in front of your audience can totally alter their understanding of themselves as a character in the story. You can make a reader feel differently about themselves by presenting choices in a different way! This is probably obvious to a lot of you who have written Twine pieces before, but I’d like to dig into this phenomenon a little bit. I want to write several blog posts covering ways of presenting choice in hypertext stories, and discuss the ways that each of these can make the reader feel differently about themselves and their role in the story’s world. The big fat bold number at the top. The stand-out questions at the bottom. The strong visual distinctiveness of the different elements on the page. The clarity of their purpose. 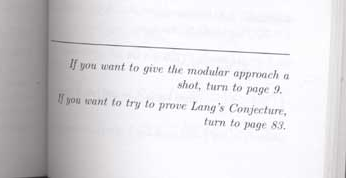 The characteristic “If you do X, turn to page Y” language. These are all part of the classic CYOA choice system, and those of us who read these books as kids have the whole “feel” of the experience carved indelibly into our brains. I’ll be classifying any choice structure that uses separate lists of choice options at the end of a narrative passage as “CYOA” style. This classic structure– as it appears in the old books– makes the story very simple to read, and makes it easy to tell that the story is branching. It was designed as a way to talk to kids. The page elements I listed above provide clarity. They’re pretty foolproof! They also directly address the experience of reading the book. “Turn to page 200!” There’s no attempt to disguise the experience or couch it in “immersive” explanations. Every page admits that this is a book, a non-traditional book, with its own particular way of being read. The whole page is set up to be clear and honest about what you are doing. It is also relatively honest about how the story works. But these clearly-demarcated, foolproof page-sections also make the experience of reading CYOA stories into a staccato, irregular experience. Choices, sequestered away at the bottom of the page, take place in a realm of frozen time– in a dimension where only the choice exists. They are separated physically and stylistically from the rest of the story. The narrative pauses– time stops. Choice happens. Time starts again, and the story continues. The reader is the story’s analog operator, and the reader needs to do the work to make it move forward. This takes time. But the reading experience isn’t the only thing this staccato organization of time affects. Separating the choices away on their own part of the page also has an affect on the way the plot of the story can leap and bound across time. As a child I was always bemused by my CYOA books’ erratic relationship with time and space. The choice region of the page was capable of eliding whole months and years, skipping over whole continents, totally eliminating whole characters and problems in a single sentence. In that frozen moment of choice, your future reached out to many different times and places at once. On page 18, you’d be boarding a pirate ship; when you turned ahead to page 72, suddenly a whole month would have passed, and you’d be tackling the next problem, whatever that was. The choice-dimension can eat whole chunks of timeline effortlessly. If you would like to go through boot camp, turn to page 99. If you would like to be digested by the Saarlac, turn to page 302. If you would like to sleep for a thousand years, turn to page 12. These books addressed your external control over the story in a very frank and honest way. You’re not really always a character living in the world of the book; you’re a reader of a complicated text, exercising your intuition and wisdom to beat the challenge of the story. 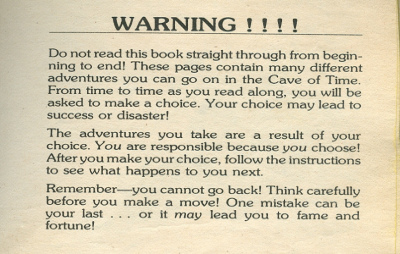 And despite what that introductory warning says, as I play more and more experimental games that push boundaries with narrative, these traditional, hyper-frank-and-honest CYOA books seem less like immersive stories that take me on an adventure, and more like trial-and-error puzzles couched in the language of power and fantasy. They do not really make me feel as if I am in control of anything. They are so clear and honest about what they are doing that they expose the author’s control to me quite clearly. Each time I choose, I think more and more about what the author is trying to communicate with the choices, what the puzzle of the book wants me to do, and so on. To adult-me, CYOA books feel more like a weird, alienating puzzle than like a participatory story. This isn’t to say that I don’t like the books anymore! These are merely the emotions and thought-processes that sequestered-choice, page-turning CYOA inspires in me. Even if you disagree with me about this, however, it’s undeniable that CYOA choice format can influence the way the reader thinks and feels about themselves and about the story. To some extent, all of these problems and advantages can appear in Twine/hypertext games which use the CYOA choice model. But with modifications, the traditional CYOA model can be altered to avoid the form’s pitfalls and amplify its advantages. Most of the cool CYOA variants I typically see in Twine stories are all about re-contextualizing the voice of the choice to make the reader feel differently about their relationship to the protagonist and to the story. These continued sentences are a good way to link choices to the story– to tear down the wall between the body text and the “choice dimension.” Although these choices are still abstracted from the physical space of the story passage, they are not entirely removed from the flow of the story’s language. There is less of a stop-start feeling to the reading experience. These first-person choices are also good at reducing the player’s abstraction from the text. They sometimes make the story sound as if you are talking to another person– they mimic the conversation of a dungeon master and a role-player. If you write your CYOA story with choices that follow this prompt-and-response structure, you create a logical explanation for why the choices are separate from the flow of the story in the first place. It sounds like conversation, and feels less artificial than the “If yous” of traditional CYOA. Then there’s choice statements written in the personal idiom of the main character, or as the character’s thoughts. Choice statements written conversationally can be used to express a character’s innermost thoughts. They can be used to show exactly what the character would say, how they’d say it, and how they would justify it to themselves. There’s a good reason why many western RPGs write out the whole choice text as if it were a sentence the player would say! In many stories, you want to ease the player into sharing the protagonist’s thoughts and feelings. How does this person think? What idioms do they use? Write it all out as a choice on the bottom of the page, and you’re turning the “choice dimension” into the “inside of the character’s brain dimension.” I think this is a much more helpful use of space on the screen. Of course, this isn’t to say that traditional CYOA language has no uses. For example, it’s very good at rustling up strong feelings of nostalgia. If you want to bring your readers back to 2nd-grade reading-hour, there’s no better way to do it than with the traditional CYOA tropes, the traditional choice sentence-structure, etc. Traditional CYOA choice setups are also extremely foolproof. They list precisely what you are about to do. They make it very clear that the story will branch. I never met a kid who couldn’t eventually figure out how to read a CYOA book! Because they address you-as-reader so directly, without the conceits of “immersion”, they’re great for stories that are more “gamey” or puzzley. Maybe, unlike me, you like pausing time in the choice dimension! Or maybe the game is intended for young audiences, or for people without experience in hypertext stories! Traditional CYOA is definitely one of the most accessible ways of presenting choice in Twine. It is appropriate for all audiences, and for many writing styles. In the end, a lot of writing is not made any worse by CYOA’s pitfalls. The first and most obvious is list-based humor. Lists provide good structure for joke arcs. When I was in undergrad, I had a column (a bad one) for a humor magazine entirely focused on telling jokes in list form. You can arrange a list of statements in such a way that the list order and format is a big reason of why the things are funny. The same is true of choices in a CYOA story. You can use the list to replicate a series of thoughts. Although this is also possible in in-line link setups, like the one I used for Swan Hill, it gains very elegant expression in a CYOA story. You can also use the list to make some choices appear more important than others. Typically, the first and last choices in a list are considered more important or distinctive than the others. Presenting choices in a list allows you to add subtle shades of meaning that are not possible– or not possible in the same way– with other choice-presentation systems. There are plenty of jokes and emotional arcs that are much, much easier to achieve when you have a set-aside space to put lists of options. If you’re going to use a CYOA structure for presenting choices in your stories, you should be aware of the subtle shades of meaning you’re adding, and the way in which your reader is experiencing time and space while they read. You should be aware of the ways in which your choice-presentation affects the reader’s concept of self. Are you using the word you? The word I? Are you telling the player what to do? Are you having a conversation with them? I hope to write soon again about inline links and why I prefer them for the kinds of stories I like to tell. They help to arrange a reader’s thoughts about themselves and their character in a very, very different way– and they pose some challenges of their own. I think CYOA will always be the simplest and perhaps most elegant way of organizing choice on a screen or a page. But it’s worth stepping back for a moment and realizing that it isn’t necesarrily the default, and it isn’t neutral. It’s a way of organizing the reader’s thoughts and feelings. It has an actual impact. And we ought to start recognizing it, everywhere it appears– even in AAA videogames, where it’s begun to change and morph in ways I never expected as a child. With some beautiful exceptions; see the Many Conclusions section of this wonderful essay.